I’m doing something different this week. 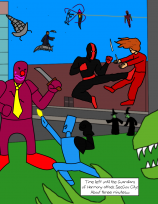 I’m not limiting myself either to superhero or supervillain, and I’m doing a group of characters, but not one that would be called a “team”. I’m just going to pick a character I liked from the previous years and flesh out their world a little bit. The character I choose is Valia, the Space God of Courage. 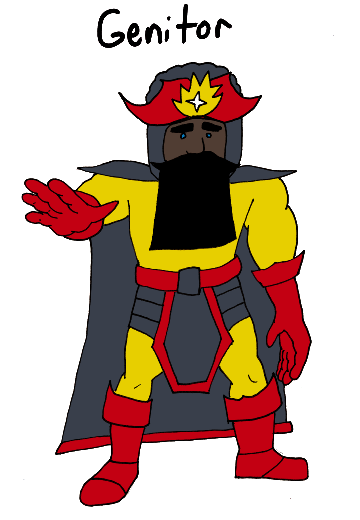 She was uploaded in the very last week of Superhero Sundays, but she made an impression apparently, so in my very first week of Supervillain Sundays, I gave her a villain with Lord Terryr, the Space God of Fear. That wasn’t enough for me, apparently, as the Space Gods of Violence, the Violence Sisters, came along later. In the beginning there was nothing. The twin Emptinesses were in charge. But then came something. Even the very possibility of something. It was: the Great Genitor, the spirit of creation itself. Genitor fought the Emptinesses for a long time, until he finally had made enough room in which to create a universe. In this new universe, Genitor begat Astrolympians, a group of Space Gods each embodying some concept or another. With this pantheon beneath him, to keep things running, Genitor is able to focus on smaller projects, like inspiring inventors or artists whose creations mean no less to him than that first one he fought so hard for. 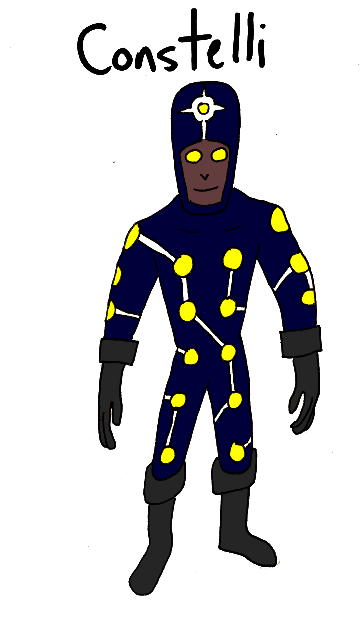 My design here is a straight-up Jack Kirby wannabe thing. If you’re creating a pantheon of space gods, I don’t think there is anyone better to emulate. I tried to make a sort of explosion theme (just that thing on his helmet and the general fiery color scheme, really) that is meant to be evokative of the big bang. 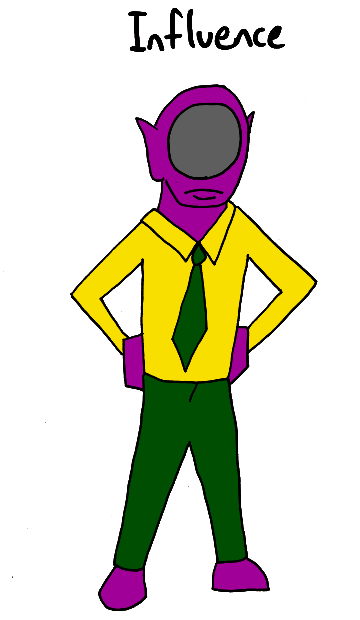 The Space God of Intelligence is Constelli. Constelli is a decent sort, aware that there’s no particularly good reason not to be. A being of rational thought, naturally, is more likely to ally with Valia than the bad Space Gods who want to tear things down and ruin it for everyone. Typically Constelli is occupied in simply studying creation from a UFO/laboratory, but will come to Valia’s aid when it seems necessary. The idea is that seeing constellations represents seeing patterns in the world and that is the first step toward rational thought. I think that’s sound enough for a Space God, yeah? Unsurprisingly, Influence is the Space God of influence. Unlike Constelli, Influence will work with anyone who wants to sway someone else, good or evil. As long as you are willing to pay tribute, he will work alongside you. I didn’t actually sketch Influence specifically for this role, but the alien look of him made me associate him with the Space Gods. Space Gods are fine and all, but you know who isn’t Space Gods? Mortals. The old epics were full of mortals. Let’s have some here. Carter Archibald was a great civil rights leader whose fearlessness in the face of overwhelming oppression caught the attention of Valia. They fell in love and Nicole Archibald was the result. 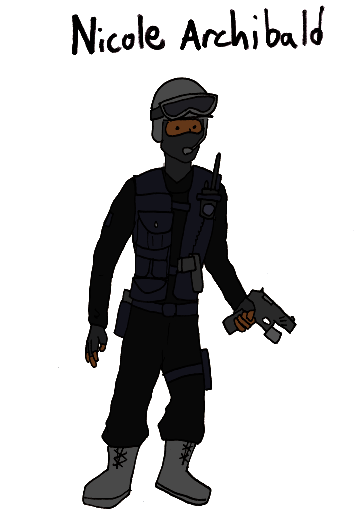 Now an adult, Nicole is a member of a special police task force for dealing with the sorts of situations that crop up with Space Gods around. She’s aware of her status as a demi-god, but has shut her mother out of her life both because she failed to save her father (who was stabbed to death when Nicole was young), but also because she isn’t quite sure how to feel about the idea that her mother is the anthropomorphization of a concept. It’s not normal to know that you are, basically, half fictional. Nicole is brave, there is no doubt, but she will not admit to being her mother’s child. Genitor sounds like a drug to treat an STD. If you say so. I mean, it’s not even a word I made up, so I have no personal stake in it.